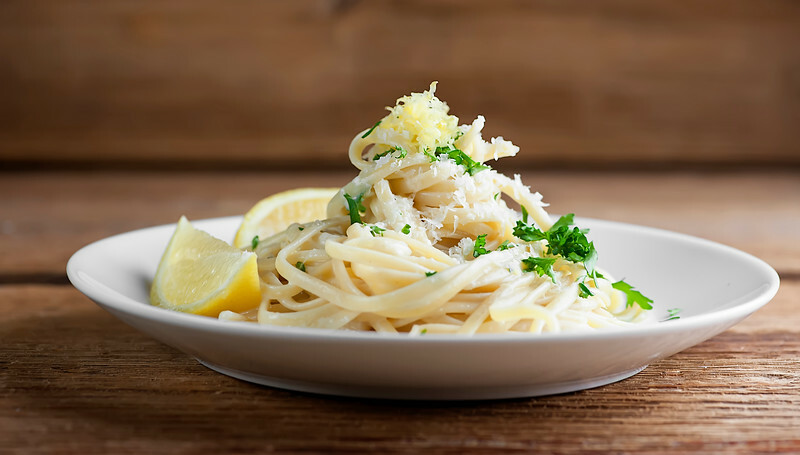 This decadent but delicious recipe for creamy lemon pasta has all the elements of classic alfredo sauce, but with a zing of lemon. Welcome to your new favorite pasta supper! It has been quite an exciting week around these parts! As I write, we have just over 300 days to go before the Southern daughter goes down that aisle with her honey, and so we are in Full Wedding Planning Mode. I rotate between excitement and overwhelmed-ness and joy and happy tears, sometimes all in the same 5 minute period, and that is a perfect time to have a supper like this creamy lemon pasta on hand. Easy, just a little bit decadent, and with all the pretty springtime colors of an early spring wedding. Ready for a plateful of pasta happiness? Let’s make it! The kids live in North Carolina and the wedding is in our home town here in New Jersey, so when they come up to visit these days we pack a WHOLE lotta wedding prep stuff into those visits. Last week was all kind of exciting, with the first event being the tasting dinner at their beautiful wedding reception venue. We very responsibly sampled everything and took copious notes so that we could make the very best decisions about the reception menu. 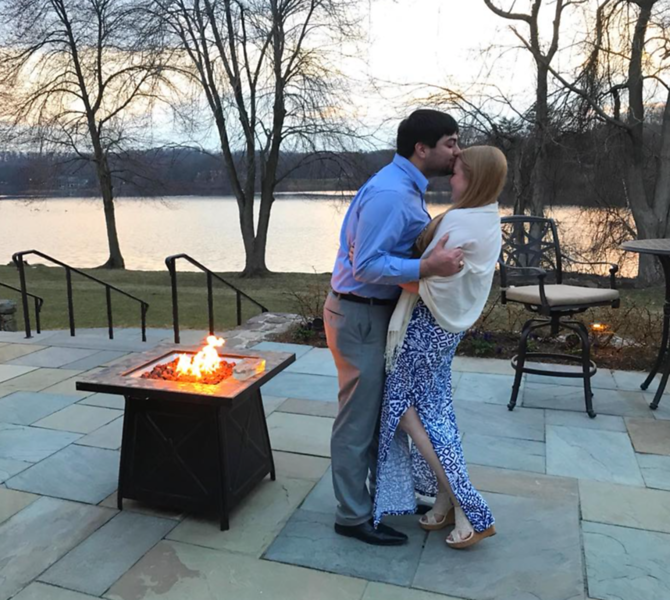 The reception venue is on a lake, and the sun was setting, and I was so happy to get this adorable shot of the adorable couple. I think they like each other. The Southern daughter then took a picture of us old folks. 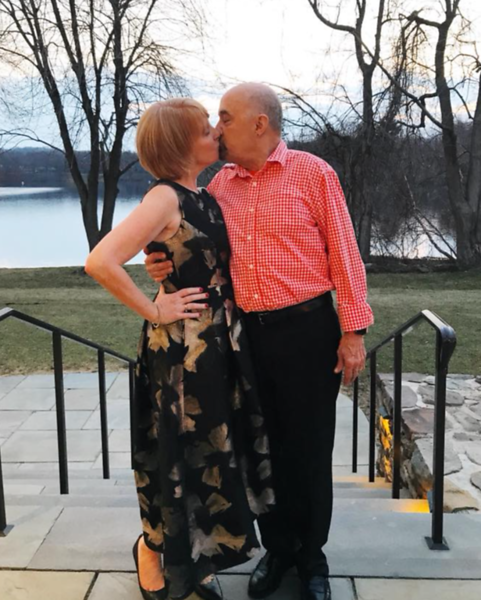 The mother and father of the bride, or as we are now calling each other, MOB and FOB. We may be a little old and creaky, but we still have the romance going! Next up was our first meeting with our amazing invitation person. We looked at a sea of designs and typefaces and colors and we are so excited to see what she puts together for us. Next stop was our first big meeting with the florist. We met with Michael from Anna Rose Florals, and talked peonies and ranunculus and hibiscus plants and freesia and corsages and flower girl petals and oh my my. 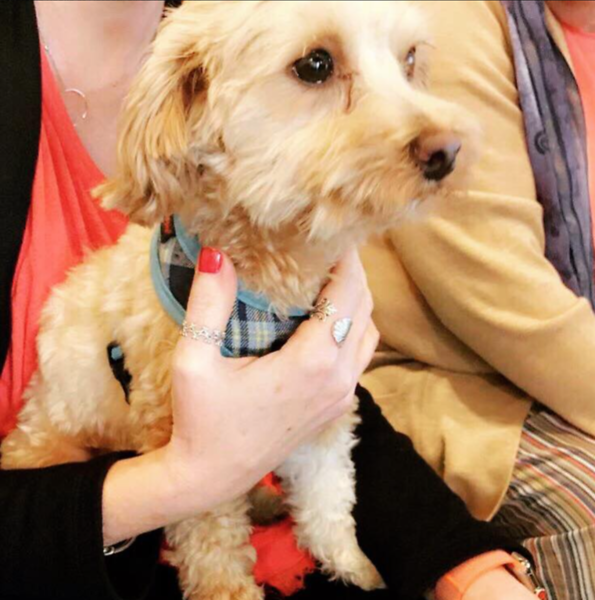 One of the very best parts of that meeting was Charlie. Charlie is the only thing in the floral shop that is not for sale. He sat on my lap for most of the meeting, and I’m here to tell you that when you are talking about your daughter’s wedding bouquet when it feels like just 5 minutes ago she was starting kindergarten, it’s extremely calming to have a Charlie to hold on to. After a few other wedding whirlwind activities, they were back down in North Carolina, and the Southern husband and I took several very long naps and had a plateful of this to calm ourselves down from all the excitement. 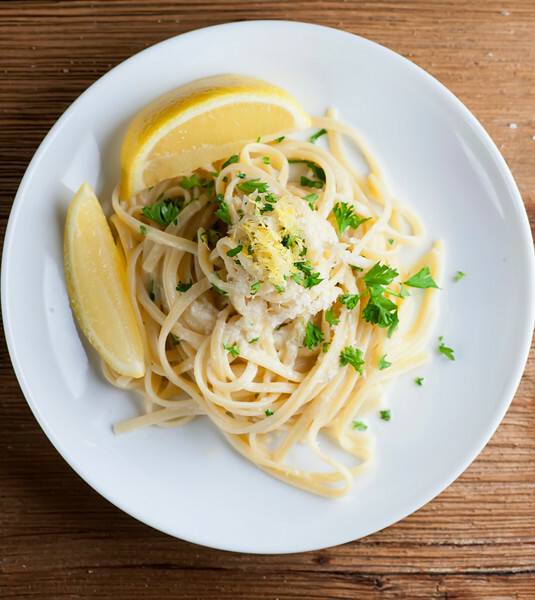 This easy peasy creamy lemon pasta is very much like pasta alfredo, but with a lighter cream sauce and a zing of lemon to brighten up the taste. It’s just the ticket for when you want elegant meets easy meets comfort food. Next stop on the Wedding Express is the engagement party followed by The Dress. Stay tuned to this channel! Cook pasta according to package directions in heavily salted water. Scoop out a cup of the pasta water before you drain it, then drain and set aside while you make the sauce. Pour 3/4 cup of the reserved pasta water and the cream into a large deep skillet and bring to a simmer. Add the pasta to the skillet and toss. Add butter, half the lemon zest, the lemon juice and the cheese and toss again. Cover the skillet, turn off the heat, and let everything sit for 2 minutes. Uncover and toss it again, adding a little more of the pasta water if the sauce needs thinning out. Taste and season with salt and pepper as needed. Divide pasta among warmed plates and garnish with parsley, the remaining lemon zest and a scattering of parmesan cheese. Twirl, taste and happy sigh. Know it will be spectacular in every way…with MOB & FOB.. sending your daughter and her beloved off on the next journey of their lives…. and yours! Now the pasta… just bought some fresh lemons so this will be in the rotation this week. Thinking about a few Spears of fresh Asparagus along side…can’t get enough of it right now! Sending all the very best… always…enjoy!